Office architecture and design have incorporated various popular influences in recent years: smart office tools, the open-ceiling industrial-chic aesthetic, and the “experiential office” trend, to name a few. The field has been slower, however, to adopt findings from positive psychology into office form and function. Positive psychology, the scientific study of the condition and strengths that enable individuals and communities to thrive, provides tools that can be used to enhance worker’s well-being, said architect Charles First, AIA, CCM, CFM. In his recently published book, “A Place to be Happy: Linking Architecture & Positive Psychology,” First drew from his more than 30 years as a registered architect with experience in architecture, project management and owner-side office culture. The book incorporates results from his own workplace studies, and along with findings from researchers across the U.S., establishes criteria for shaping spaces for the benefit of the people who work there. An Ohio-based developer of these specialized properties describes how it is capitalizing on growing opportunities as well as evolving market trends. AN AGING POPULATION and medical advances that are extending the average person’s life expectancy are increasing the need for skilled nursing facilities. Developers are responding by gearing up to build more of these projects to meet the expected need. One such company, Premier Health Care Management, a Cincinnati-based nursing home developer and operator, plans to double in size in the next three years by expanding its total number of beds from 700 to 1,200 through building renovation, expansion and ground-up construction. 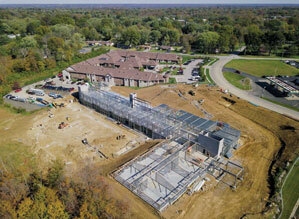 Premier’s in-house architectural team, PHCM Construction Inc., is currently working on five nursing home development projects with a combined construction value near $100 million. All are geared toward capitalizing on market trends that include residents’ desire for private rooms and more amenities. These trends, along with variables such as site conditions, occupancy codes and availability of financing, are among the primary challenges faced by most senior living development projects. Does Your Modern Build-out Have a Hearing Problem? Open ceilings, exposed concrete floors and glass-walled spaces are the hallmarks of contemporary interiors. These design choices convey a hip and modern mindset for the companies and retailers that inhabit them, but they can come with a drawback that impacts business: noise. 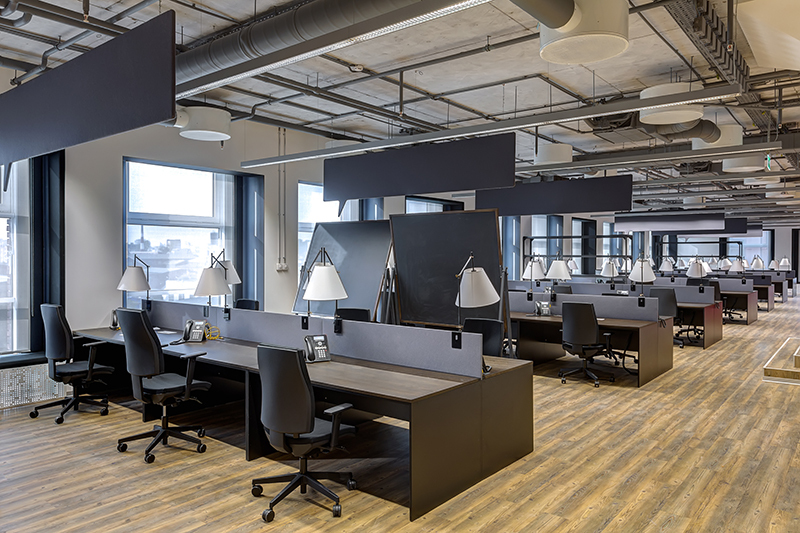 Without the sound-dampening effects of the acoustical tiles used in drop ceilings and wall-to-wall carpeting and other soft surfaces, ambient noises such as conversations, whirring heating and cooling systems, and shifting furniture are amplified. And plans to mitigate this heightened noise can add extra materials, labor costs and time to your build-out. Smart Building As-a-Service refers to third-party companies working with building owners to deploy technology to maximize efficiency and use data-driven analytics to understand better how people operate within the building. For example, if building owners and managers subscribed to a sensing-as-a-service firm, the firm would be responsible for not only installing the equipment but also managing, analyzing and reporting the data the sensors collect. THE METROPOLITAN Downtown Columbia, one element in the master plan for Downtown Columbia, Maryland, is the first new mixed-use, multifamily project to be developed in the area, which eventually will incorporate a vibrant, walkable downtown that will complement what was formerly an inward-focused mall. Developed by Kettler, the six-story, 375-unit apartment building features ground-floor retail space that faces a 0.82-acre promenade. While the primary goal for the landscape architects designing this promenade was to create an appealing open space, they faced several additional requirements and challenges, including the need to integrate a public art component, fulfill county requirements for a playground area and comply with state stormwater regulations. The design for the promenade, which was completed in summer 2015, incorporated an integrated micro-bioretention system, educational and interpretive signage, and abstract play sculptures. The result is an iconic open space lined by shops and restaurants that connects Downtown Columbia, the mall and the surrounding community. The roughly $1 million promenade also offers some valuable lessons for landscape architects and developers. Open ceilings, with their exposed ductwork and industrial vibe have become popular – but trendy rarely equals inexpensive. For many years, omitting the traditional drop ceiling was assumed to be not just cooler but also to cost less. Common sense seemed to be that by choosing open ceilings, the cost of the drop ceiling was simply avoided, saving on labor, materials and time. A 2008 study of retail and office interior construction in five cities seemed to back up that assumption. Sponsored by the Ceilings & Interior Systems Construction Association (CISCA), the study found that initial construction costs for suspended ceilings were 15-22 percent higher than for open plenums in offices, and 4-11 percent higher in retail spaces. According to an article in the Denver Post, downtown Denver is about 5 degrees hotter than surrounding areas in the summer due to the heat radiating from concrete rooftops and pavement. Denver ranks third in the country for the severity of the “urban heat island” effect — described as a phenomenon that increases air conditioning use and worsens air quality. Citing a solution, the Denver Green Roof Initiative placed an initiative on the November 7 ballot, which recently passed, that will require buildings 25,000 square feet and over, constructed after January 1, 2018, to cover at least 20 percent of their roofs with gardens or solar panels. Denver joins San Francisco, New York, London, and Paris in cities around the world with similar requirements. Realtors, contractors, and builders opposed the initiative, citing a rise in construction and housing costs as their primary concern. The Green Roof Initiative estimates a green roof will cost about $15 more per square foot than a traditional roof but will pay for itself in six years. 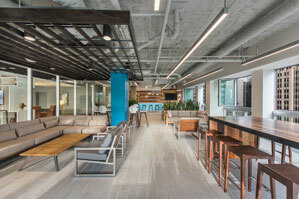 A fresh-air, 28th-floor amenity lounge has transformed a Chicago office tower. EXPANSIVE CITY views might be the greatest advantage offered by an upper floor of a downtown high-rise. But once you turn your back to the windows, it’s easy to forget that you’re in the center of a bustling city. You could be on any floor of any office building, anywhere. That’s not the case at 200 West Jackson, a recently redeveloped building in downtown Chicago. On the 28th floor of this office tower, windows open during warm weather months to bring in fresh air and the sounds of the city below. This full sensory experience creates an inviting and comfortable atmosphere for a hospitality lounge, where building tenants socialize, collaborate and recharge. After a hurricane, the cost to rebuild and repair can run into the hundreds of millions. Construction firms are taking action, investing in resilient buildings that can withstand flooding and power outages from future natural disasters. “It’s entirely a builder or a property owner’s choice of whether they want to do extra work to prevent property damage or have the right insurance or not,” Simon Koster, a mechanical engineer and principal at JDS Development Group, told Science Friday. “Those are the choices that people are starting to make voluntarily.” After Hurricane Sandy hit New York City in 2012, Koster’s group decided to design a building, American Copper, resilient to hurricanes. The lobby is lined with stone that will not weaken with moisture, and the mechanical equipment, typically found in the basement, is located on the second floor above the flood line. Additionally, a park doubles as a bioswale and helps divert water from the building. Koster predicts building resilient architecture will become the “new normal” for cities and that it is no longer a question of if a storm will strike, but when. Incubators, accelerators, start-up spaces – the lines are often blurred on what these buzzed-about terms mean. In a new report from the Brookings Institute, “Innovation Spaces: The New Design of Work,” authors Julie Wagner and Dan Watch shed some light on these spaces and the trends contributing to their proliferation. 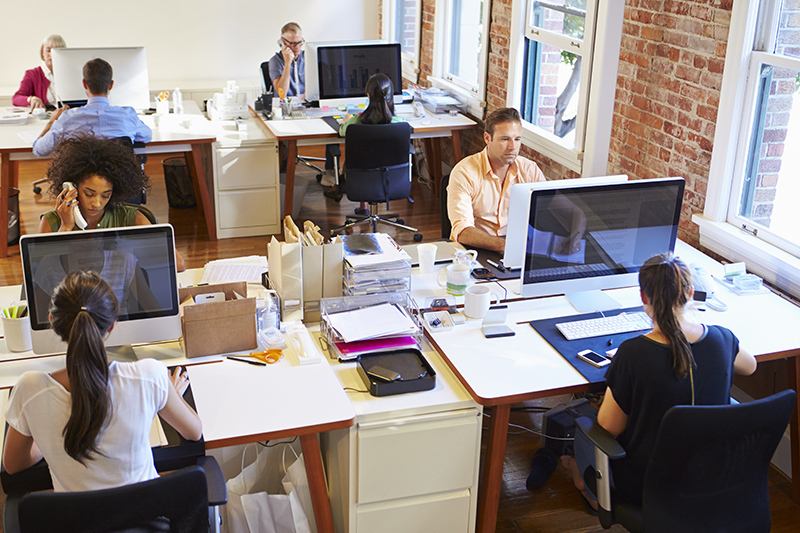 The conversation about indoor environments is changing as tenants leverage new technologies to support employee productivity. OVER THE LAST decade, a slow and steady evolution has been taking place in the commercial built environment. Building owners, architects, engineers and various service providers are moving to incorporate new technology that optimizes worker productivity, space utilization and the operational efficiency of a building over its useful life. They are also seeking to create workplaces that help companies recruit and retain talent. Many commercial buildings now include features such as operable windows, dynamic glass, smart metering, prefab construction and chilled beam HVAC systems, all of which aim to optimize the indoor working environment for productivity, health and overall well-being. While a number of these technologies and approaches have been available for quite a while, many are now moving from being the exception to the norm. 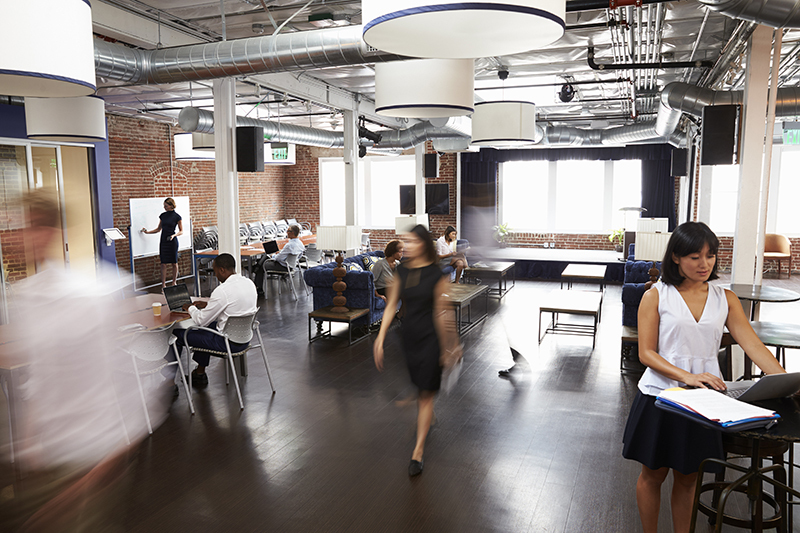 As employees increasingly work from a variety of locations and companies lease co-working spaces – or even do away with offices altogether – real estate developers and owners seek the ever-elusive “edge” that will keep their companies and their buildings competitive. To do so, developers are expanding building amenities to entice top talent and facilitate staff engagement. According to Colliers International, traditionally only 3 percent of commercial real estate was devoted to amenity space; today, the recommendation has more than tripled to 10 percent, or up to 12 percent to attract high-value tenants. The value of increasing amenity spaces can be significant: CBRE has reported that in one instance, amenities like gyms, lounges, and restaurants boosted asking rates by 15 percent. Amenities have typically ranged from providing daily conveniences (dry cleaning, food courts, etc.) to recreation or health (gyms, saunas, clinics, etc.). To appeal to a younger generation, building owners are in a race of amenity one-upmanship, with popular amenities like table tennis and complimentary food becoming less of a differentiator than health complexes, basketball courts and hair salons. Living wall systems can be simpler to install and maintain than one might expect — and can have meaningful impacts on building owners and occupants. There’s no doubt that indoor plants can improve people’s health and mood. According to a 2015 study published in the Journal of Physiological Anthropology, “interaction with indoor plants can reduce physiological and psychological stress through suppression of autonomic nervous system activity and diastolic blood pressure and promotion of comfortable, soothed, and natural feelings.” Architects have devised various ways of incorporating indoor plants into the design of corporate, commercial, and even industrial work environments, including living green walls. A forthcoming study by the NAIOP Research Foundation, “Activating Office Building Common Areas,” will look deeper at this trend, specifically examining buildings’ common areas and how some owners are “activating” these common spaces to make their buildings more vibrant. Through surveys and interviews, the study examines the activities, designs, costs and more associated with creating vibrant communities inside office buildings.